Three years ago, long after the phenomenon of the Harry Potter novels and the film adaptations of them had taken the world by storm, I watched the movies for the first time. Scored a, shall I say, fantastic Black Friday deal for the whole lot of them on Blu-ray and truly loved the journey, from the awkwardly but appropriately childish first two entries directed by Christopher Columbus (and boy did they feel like they were directed by Columbus), the major step forward third film directed by the great Alfonso Cuaron, a rock solid fourth movie directed by Mike Newell and then Davis Yates took over for the final four installments, with his two-part Deathly Hallows conclusion being simply, well, fantastic. Sorry I keep doing that. It's just the right word to use sometimes. Catching up on these films after the fact made the story feel like it had a finality to it, like I was watching a sprawling, epic story playing out knowing that once it was done, it was done. Little did I know that an entire side franchise would spill out from the same universe, as well as the inevitable return of Harry himself when the newly published Cursed Child eventually finds its way to the big screen. Here we have the first of what will apparently be a five (?!) picture story, Fantastic Beasts and Where to Find Them, and even being only a late blooming, relatively mild Potter fan I felt a certain warm sensation when the Warner Bros. logo filled the screen with that familiar musical cue. It felt right, like I was sitting down for a couple hours of adventurous and literally magical fun, and the good news here is if that is what you seek, that is what you shall get. After taking on those final four Potter pictures, Yates returns behind the camera for Fantastic Beasts and word is he will do the same for all five of them as well, putting his stamp on a franchise that obviously means a lot to him, as many other filmmakers would likely hesitate to stay in one place for such an extended segment of their career rather than being able to branch out and try different things. The photography here is a mixed bag, as at times it feels so refreshingly crisp and alive, like what is being captured is both impossibly imaginative and magical and yet real, like set pieces that you could walk through yourself and believe in the world they created. At other times, though, there is something certainly off here compared to what was achieved during the expansive Potter years, and I think the difference is here a lot of the time it is obvious what we are looking at are sets meant to feel like 1920's New York City rather than just actually feeling like it authentically. Half the time it was as if I was being swept away again by what made those Potter movies great, but the other half was looking to scratch that itch that begged for the same charm to return. On a character level it would be basically unfair to expect similar returns, as watching Harry, Ron and Hermione grow up together all while dealing with the many others walking the halls of Hogwarts, played by a vast array of tremendously talented people, proved to be a wonderful and unforgettable experience. Eddie Redmayne is fine playing Newt Scamander, and that's coming from someone who thought I could never forgive him for his portrayal of Lili Eibe in the brutally bad The Danish Girl. He's just fine here. The problem with that is, as the lead of the film he needed to be more than that but beyond playing Stephen Hawking, I have severe doubts that Redmayne is capable of doing it. Many would argue INCLUDING playing Hawking he isn't able to carry a picture, but I still consider that performance to be quite impressive. 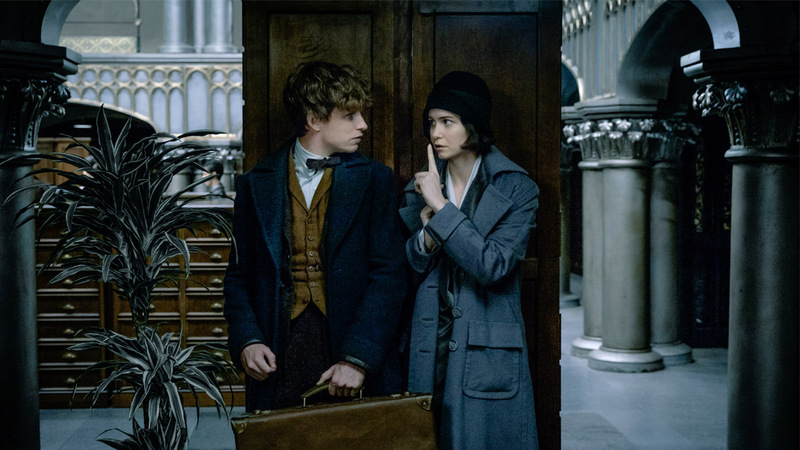 Katherine Waterston is always terrific and she doesn't really disappoint in Fantastic Beasts, but her character is meant to develop a palpable chemistry with Redmayne's Scamander and I simply never felt it. Dan Fogler actually rises to the occasion to be MVP of the film because he has the right comic personality that is so desperately missing from the lead character, and Colin Farrell is just fine doing his ominous, guy who has secretive conversations in the shadows thing. Also, Ezra Miller is perfectly cast as a kid who gives me the friggin' creeps, because Ezra Miller plays that well. I'm looking at you, We Need to Talk About Kevin. The plotting of Fantastic Beasts is strange, even though the winding path it takes throughout does eventually add up in the end. 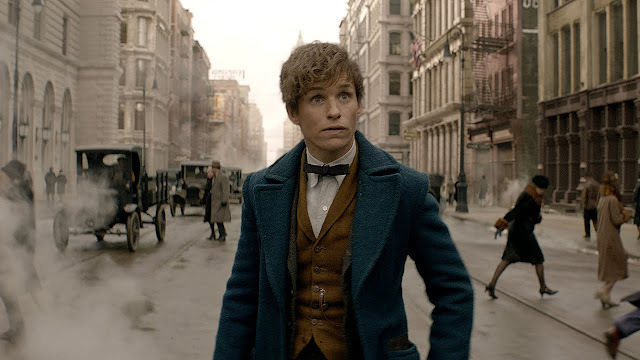 See, the issue is that the premise built early involves Scamander basically playing Pokemon Go in New York City, on a desperate search for his missing beasts hoping to capture them all in his case because others get their hands on them, but really this collecting of beasts is so inconsequential to main conflict in the end. Sure, it's the reason Scamander and others go from point A to point B and C and so on, and the actions of those beasts bring a lot of vivid colors and entertaining action to the movie, but all they really serve for the big picture is as a scapegoat for the disastrous damage being inflicted on the city that is actually due to a lurking evil no one wants to believe in. So while the beasts are necessary and at times quite fun, my only real criticism of the way they fit into the story is perhaps some of the meat could have been trimmed off of these cinematic bones. By that I mean, if the true danger that will likely carry the franchise forward from here is being hidden in a subplot tucked off the to the side, maybe some of those beast catching moments could have at least been shortened as to avoid Fantastic Beasts being over two hours long, especially considering they are going to stretch this puppy out over another four films. Despite what certainly feels like a large amount of complaining, the truth of the matter is a lot of what I bring up will be written off to nothing more than nitpicking to many, many others who go to the cinema for a slice of enthusiastic entertainment, who are looking for the means to be distracted from reality and Fantastic Beasts will surely fill those shoes. Also, I can't help but wonder if the only real fair way to approach this movie is to evaluate it on its own, because even though it is impossible not to lump it in with the Potter films mentally, the truth of the matter is Fantastic Beasts and Where to Find Them is its own...well, beast. Damn it. It exists in the same universe as the other movies and ties between them have already been established and I would imagine will be strengthened over time, but for now putting this one movie alone under its own spotlight, Fantastic Beasts is good. Real good. For me, better than the first Harry Potter film because this has a stylistic maturity to it that was sorely missing from those Columbus efforts. The question is, where does this new offshoot story go from here? Will there really be strong enough material to not only build upon what is already established but actually improve upon it as well? I have my doubts that anything related to Fantastic Beasts will be as eye opening as the jarring step up between The Chamber of Secrets and The Prisoner of Azkaban, but I will be there in the theater every two years hoping to be proven wrong. Fantastic Beasts was very enjoyable, and I loved going back to the wizarding world. I feel like I enjoyed this film a lot more than the average person, but overall I felt like this film did a lot in only two hours and for that I commend it greatly. Very nice Cody! Yeah, I am a fan of Harry Potter but not in the way many others are, so I didn't carry with me that romantic feeling of wanting to return to this world, but I still enjoyed it.